We already had a post regarding the mean reverting tendency of Volatility, now it`s time to make some money using this information. But unfortunately life is not that easy, VIX is just an index and you will not be able to buy or sell it. 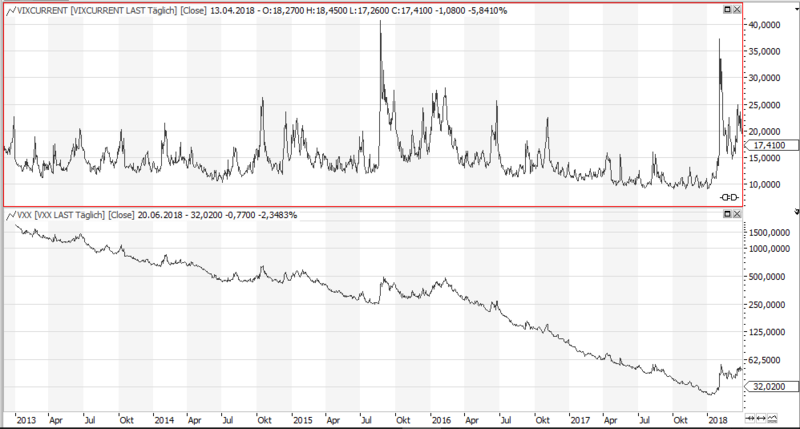 You might try to trade volatility using options, but there is a better plan to make money on this wonderful asset class, the VXX, BRCL BK IPTH S&P 500 VIX SH FTRS ETN. VXX – the perfect money printing machine? The VXX is an ETN which tries to follow the VIX on a short timescale by having exposure to the first 2 VIX futures contracts. But like with commodities, where the further out contracts cost more (a risk premium), this leads to severe losses in the long run. You buy expensive (far out) and then the premium melts away. This is a general problem of all ETFs which try to follow a physical market, and will be my edge in making money. Like VXX also USO and UNG (physical Gas and Oil ETFs) are doomed to go to ZERO in the long run. Only reverse splits could hold them from reaching this target by now. I am not up to track or trade the VIX on a short term basis, I am more interested in making money due to this structural bug build in in the methodology used to track the VIX. So for me VXX (similar to USO and UNG) is a long term short investment. note the logarithmic scale for VXX! 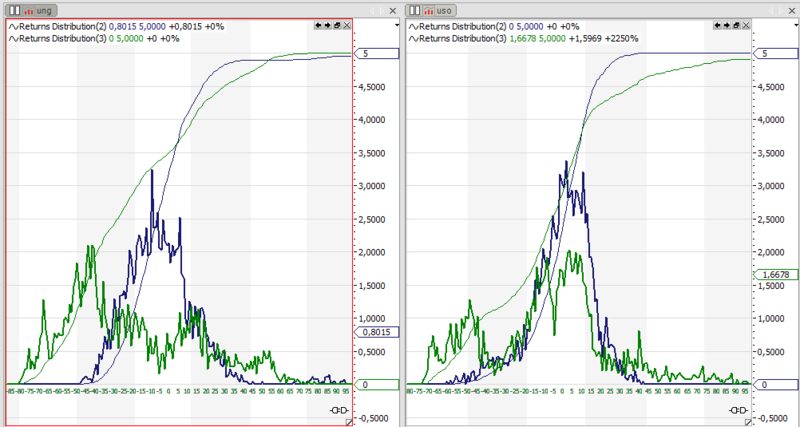 The above chart gives you the returns distribution of VXX over 5 -50 -250 trading days. On a yearly basis you hardly had any positive return, and the median loss (=win for shorties) would have been 47%. Even the 2-month 50 day return has got a median of -17%, with only a 20% chance of a positive return over this period of time. So the odds are clearly with you, the longer you hold, the more you gain. On the other side, things are never that easy as they seem, it would be suicide just to invest all your money in a VXX short trade. Even when the odds are on your side, you will get a problem with risk. 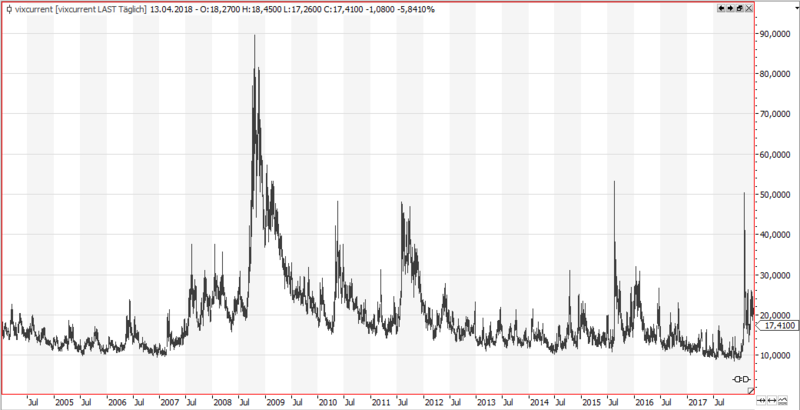 While VIX has the nasty tendency to quadruple from time to time, it even went from 10 to 90 in 2008, VXX as a short term tracker of VIX could also behave like this. Since 2013 when the instrument came into existence, there has been several incidents when VXX at least doubled on the short term. That would be the incident when your broker gives you a markin call or closes your position at the worst possible moment. To be on the safe side don`t invest more than 5% of your account into a VXX short trade! Also be aware of the borrowing costs your broker will charge you. if too high, a vertical call spread might me more favourable. Remind, this is not a beginners trade! 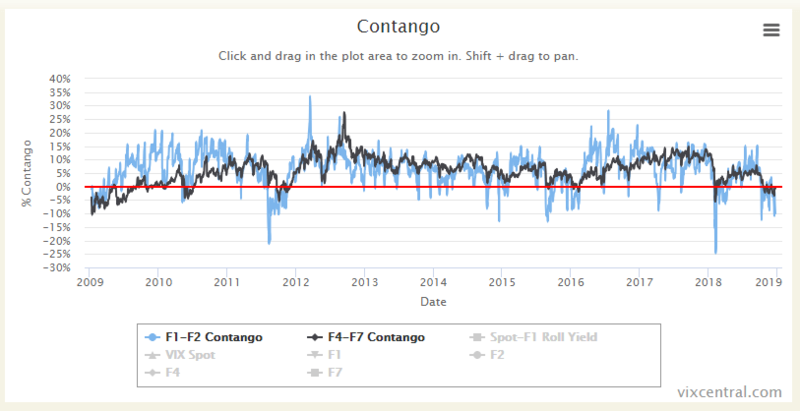 Your edge in trading VXX is not the trend down, but this fundamental problem in tracking the VIX index using the next two months futures contracts. The same problem which brings down the united states oil and gas fund USO und UNG. Like the VXX the returns distribution (50 and 250 days) gives a clear indication to trade these instruments only on the short side. These returns distributions, caused by the the fundamental tracking problem of a futures market, make VXX, USO and UNG my private money printing machines. Beware: VXX short means you will lose when the overall market crashes. So be sure that the rest of your portfolio is set up to make money when this happens. Otherwise a margin call will kill your trading career. VXX short is not a beginners trade. USO and UNG might be more suitable from a risk level standpoint.